Would you make a good pharmacist? Take our career test to find out how you match with this and over 800 other careers. What is the workplace of a Pharmacist like? Why are there pharmacists? Can't a physician do their job? What are the advantages of being a pharmacist? What is some good advice for pharmacist students? What is it like being a pharmacist? 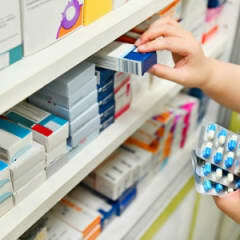 A pharmacist is someone who traditionally works in a pharmacy (chemist shop, UK) and is in charge of the dispensing of prescription medications. A pharmacist has expert knowledge of medications and can advise members of the public in this matter and will also give advice on over-the-counter remedies that can be purchased for minor ailments or non-serious illnesses such as a cold. There are also specific specialty pharmacists, some of them being veterinary, oncology, clinical, nuclear, consultant and industrial. Others may work in research relating to the pharmaceutical industry, researching new drugs and other health and nutrition issues. The pharmacist is often the first point of call for someone suffering from a minor illness or in the initial stages of an illness, and relevant advice is given. In some countries now, especially in Europe, community pharmacists have been given prescribing power. This means that there are certain medications that can be prescribed by the pharmacist after a brief consultation with a patient. Additional requirements are often required of the pharmacist in order to be allowed to prescribe certain medications. In hospital pharmacies, the job involves more specific drug measurements and preparations - for example confirming prescribed calculations of doses dependent on the patient's weight, and making sure that the correct dose is given. Hospital pharmacies deal with stronger and more dangerous drugs more often than community pharmacies do, and provide a vital service within the hospital. Generally, all pharmacists have expert knowledge about medicines and can apply this in different ways, depending on their chosen speciality or area of work. Are you suited to be a pharmacist? Pharmacists have distinct personalities. They tend to be investigative individuals, which means they’re intellectual, introspective, and inquisitive. They are curious, methodical, rational, analytical, and logical. Some of them are also conventional, meaning they’re conscientious and conservative. Does this sound like you? Take our free career test to find out if becoming a pharmacist is right for you. The workplace of a pharmacist will vary depending on the area of specialty. Typically a pharmacy is a small shop or a small department within a supermarket or larger drugstore where the pharmacist will work closely with dispensers and sales associates. A pharmacist has a somewhat social job and deals with many different people in the workplace day-to-day, including customers and drug representatives. Pharmacies can get busy and being able to work quickly when under pressure will be helpful. Hospital pharmacies are much quieter and less busy, there are fewer people to deal with on a daily basis and only medications to dispense; patients in a hospital are usually seeing a doctor, so there is no need for the pharmacist to give consultations. In a research position the environment will vary as well. There may be a lot of interaction with patients involved in clinical trials, or with drug companies and representatives, or on the other hand, there may be quiet laboratories dedicated to research. Within the field, there is enough variation to choose a specialty which will allow for the pharmacist to work in the environment best suited to his/her own personality. Pharmacists know all there is to know about prescription drugs - they are medication experts. The average pharmacist knows much more about drugs than the average physician - it simply is not a physician's field. There is a lot more to a pharmacist's career than just printing labels and counting pills. Because everyone can make a mistake, a pharmacist will double check and make sure that the medication a physician has prescribed to a patient will not interact with other drugs the patient may be taking. It is not unusual for a pharmacist to call the physician to confirm dosage, as it is easy to write the wrong amount, which will result in a dosage that is either too low or too high. They will make dose adjustments, they will check chemotherapy calculations - they will basically act as a gatekeeper between the patient and harmful drug interactions. There are also many time-consuming duties that a pharmacist deals with, such as ordering supplies, figuring things out with insurance companies, and handling the many regulatory compliance issues. Physicians are glad there is a division of labour so that they can concentrate on treating their patients. One of the biggest advantages of being a pharmacist is that you'll be making significantly more than most careers - more than a teacher, a social worker, or even a nurse. Salaries start from $89,000 and go up to $147,350, according to the US Bureau of Labor Statistics. Job security is another positive - pharmaceutical careers are in demand and are expected to have higher-than-average growth in the future. Yet another advantage is that pharmacists are often able to provide feedback on a medicine's side effects and/or a medicine's effectiveness - information that can be used in drug engineering and in technological and medical advances. The job can be somewhat stressful at times, but it is less stressful than other medical professions. If you work in a small community, you will develop relationships with regular customers over a period of time, and see their progress as you work with them. One of the best ways to figure out whether pharmacy is the right career path for you, is to volunteer or apply for a job as a pharmacy technician. It's important to have some work experience for your resume, and at the same time, it will expand your understanding of what the career entails. If you do decide pharmacy is for you, there are a few things you can do to get the most out of school. A couple of fairly obvious pointers are to make sure you go to class and take good notes. Surprisingly, quite a few students don't go to class on a regular basis, and assume they can catch up later. Unfortunately, this will only worsen your study performance, so try and make it a practice to go to all your classes. While you're in class, take thorough, consistent and organized notes. Record the class lecture, if allowed, so you can go back and refer to the lecture if needed. Ask questions if you need clarification on the material. It shows the professor that you're engaged, and keeps you alert in class. If you're on the shy side, write the question down and ask the professor if you can speak to him/her one-on-one, or just communicate by email. Balance your time. It can be overwhelming to juggle school, assignments, studies, work, and extracurricular activities. Try typing up notes into a study guide, or listening to recorded lectures the day after class etc. Try not to cram for an exam. Rather, study your material on a daily basis. A rule of thumb is that you should be studying two to three hours for every hour in class. Stress in unavoidable, especially in pharmacy school, but try to eat fairly healthy, exercise, take breaks, and keep a regular sleep routine. The pharmacist's job is an important one, and requires careful attention to detail. A typical day can involve checking and dispensing medication, compounding medication, communicating with physicians, providing patients with pharmaceutical information, providing patients with health advice, explaining the proper use of medication, supervising staff/pharmacy technicians, etc. Occasionally, pharmacists will have to deal with an upset or rude customer, however this is not a frequent occurrence. While a pharmacist's tasks will vary somewhat, each day is fairly similar and requires repetitive work. Days can be long (sometimes twelve hours long), and most of those hours will be spent standing. If you work for a retail/community pharmacy, you will most likely have to work weekends, evenings, and some holidays. Hospital pharmacies have more stable daytime work schedules. If you own your own pharmacy, you will be able to set your own hours. A pharmacist has a doctorate degree - a PharmD, or Doctor of Pharmacy. Many professions require a doctorate degree (for example, a professor, a phsychologist, etc). However, they are not "doctors" like your medical doctors are. For example, while in a crowded airplane flight, someone yells out "is there a doctor in the house?" would or should a PharmD stand up and approach in the affirmative? Probably not. Clearly here they are referring to a physician that has completed medical school and can take charge in a medical emergency. It takes between six to eight years to become a pharmacist. All aspiring pharmacists are required to earn a Doctor of Pharmacy (PharmD) through a doctoral program accredited by the American Association of Colleges of Pharmacy (AACP). To enter into PharmD, students will be required to complete a four-year bachelor's degree in health sciences. Combining class work with practical experience, pharmacy programs usually take four years. Some schools offer an accelerated three-year program, while others offer a "0 to 6" program, according to the American Association of Colleges of Pharmacy. This type of program admits high school graduates for a six-year program that combines pharmacy prerequisites with professional school.